"Mountain territory” club’s projects. Anoxic summits and freeride descents from the highest mountains in the World. We are two sportsmen who challenge themselves and nature. We submit and perform ski descents from the highest mountains (8000+ m) in the World without using bottled oxygen. We create high-quality film episodes for extreme lovers and a general public. 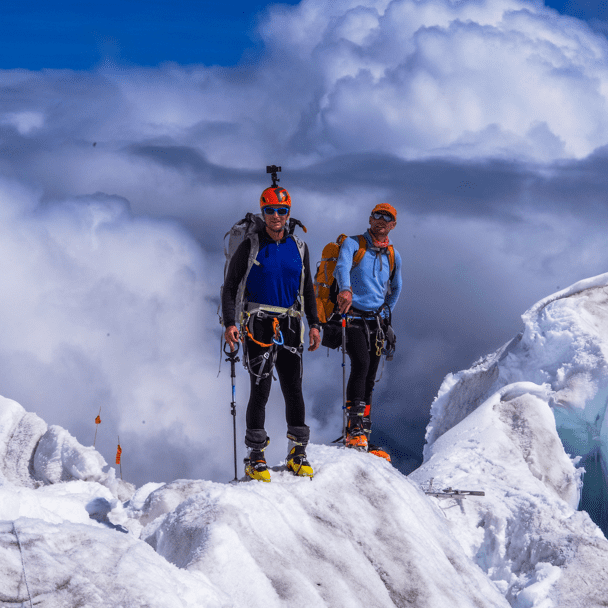 We make mountaineering and ski-mountaineering popular. Master of mountaineering, member of Russian National Team, a multiple champions of Russia. Made a lot of first ascents and climbed the most difficult walls in the World (Aksu, Troll Wall, Grandes Jorasses). 10 times conquered the summits more than 7000m high including the most difficult grade routes. Leader of “Mountain territory” club, ski-mountaineer. Participated in more than 20 high altitude expeditions. Made ski descents from the top of Lenin Peak (7135), Pobeda Peak (7438), Manaslu (8163) without using bottled oxygen. High altitude cameraman. Please, check your e-mail, we send you important message.